Entries are now sought for projects completed in 2018/19. 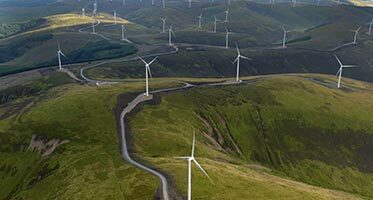 We're looking for the most innovative, creative and sustainable contributions to Scotland's built and natural environment. Our Awards celebrate outstanding civil engineering achievements and the contribution civil engineers make to our quality of life. We showcase the people who design, build and maintain the infrastructure on which we depend and the projects which transform our lives. We have partnered with CECA Scotland on a refreshed format for the Awards this year and are planning an exciting lunchtime event to which you will bring to your industry partners at the end of September. Sponsoring the Saltire Civil Engineering Awards is a great opportunity for you to directly reach our key civil engineering audiences via a range of sponsorship packages. Other sponsorship opportunities are available. The iconic 1.7 mile (2.7km) Queensferry Crossing – the longest three-tower cablestayed bridge in the world – forms the centrepiece of the largest infrastructure project in Scotland in a generation (£1.3 billion investment). A new crossing was needed to replace the Forth Road Bridge (FRB), which was nearing the end of its design life and carrying more traffic than originally intended. The project boasts several firsts including the longest continuous underwater concrete pour and the longest freestanding cantilever. 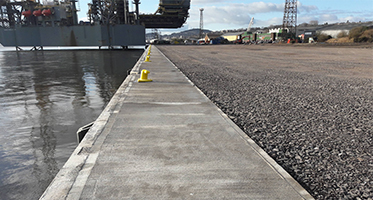 An engineering project of extraordinary scale and complexity the Forth Replacement Crossing epitomises professional excellence in all aspects of its design and construction. The state-of-the-art project both safeguards a vital transport corridor and enhances an already iconic location with its elegant design. The Sighthill area in Glasgow has undergone the first step in its ambitious transformation from a derelict, contaminated landscape to an attractive new urban neighbourhood thanks to civil engineers. The 50 hectare site encompassed numerous industrial facilities including chemical works, above and below ground rail infrastructure, brickworks and landfill from the M8. Sighthill was home to the St Rollox chemical works – the largest in the world in the early 19th century – which produced sodium carbonate (soda ash or crystals). The manufacturing process was massively inefficient, resulting in the dumping of large amounts of a waste material called galligu. Galligu presents a number of challenges and cannot simply be excavated as the physical handling process can cause its solid state to liquefy. This project combines innovative design with a semi-subterranean production facility supporting a complex but gently undulating timber roof structure which, topped with a wildflower meadow, blends beautifully into the surrounding landscape. Engineering ingenuity was required to build such a cutting-edge structure alongside existing distillery operations, which presented designers and contractors with many of the challenges typical on a major infrastructure project in a sensitive environment with stringent major hazard requirements. The people living on the world’s most remote inhabited island, accessible only by sea now have modern, fully-functional medical facilities, thanks to Scotland’s engineers. This exceptionally challenging project involved the design and construction of a new healthcare centre on Tristan da Cunha – a semi-dormant volcano lying in the southern Atlantic between the tips of South America and South Africa. Home to just 256 people, health facilities on the island were in poor condition and not fit for purpose. With no harbour accessible for ocean-going vessels, the project demanded a huge degree of forward planning and logistics. All materials, plant and equipment had to be delivered on a single ship and transferred to shore. The West Coast Main Line is a vital railway link for passengers and freight between Scotland and England. 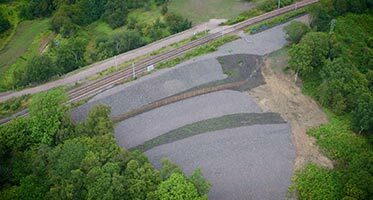 In 2013 a major geotechnical failure in the Garriongill embankment in the Clyde Valley threatened rail operations. To safeguard this vital transport link situated within a Site of Special Scientific Interest (SSSI) and Special Area of Conservation (SAC), a 22,000-tonne stone buttress was installed, with minimal disruption, to safeguard the route for decades to come. The project recycled as much water as possible to avoid possible contamination and offset the environmental impact of the work by a factor of ten. 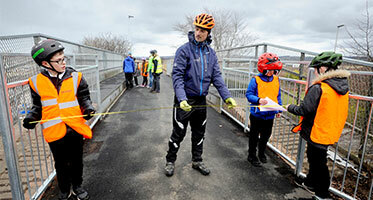 Spanning Edinburgh and Midlothian, the new 3km section of the popular Loanhead Path runs south of Lasswade as far as Shawfield Park in Danderhall, bringing new life to a former railway line. The path comes ahead of 5,000 new homes,schools and commercial development over the next 20 years. Built between 1825 and 1830, Ness Weir raises the water level of Loch Dochfour by almost two metres and Loch Ness by 1.2 metres, retaining around 100,000,000m³ of water. It has a history of scour damage and a breach of a similarly constructed weir nearby prompted Scottish Canals to upgrade it to protect Inverness from flooding. 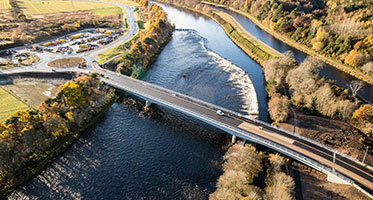 The River Ness is a famous salmon fishing river with freshwater pearl mussels further upstream which depend on the fish. 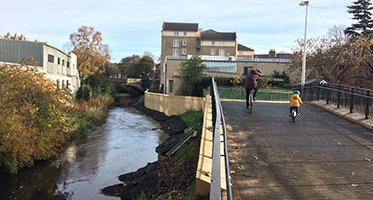 In-stream works were restricted to a four-month window from July to October to protect the environment and water quality was continually monitored. A temporary fish pass was required for one week during a critical phase of the piling works. Its installation, by helicopter, presented a significant challenge. North Sea decommissioning and renewable energy markets are a major contributor to Dundee and Scotland’s economy. Driven by the increasing demand from these markets, the Port has significantly increased its capacity by constructing a new 200m x 40m quay extension to the existing Prince Charles Wharf, comprising normal and heavy lift areas. This unique and challenging project involved construction above a failed existing quay. Incorporating the older structure into the design made maximum use of existing materials with no removal offsite and removed the need to have marine plant in the Firth, removing the risk of potential pollution. 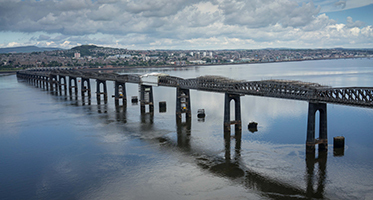 The Tay Bridge is Britain’s longest rail structure, spanning almost 3.3km across the Firth of Tay. It has been in operation for over 130 years and carries the Edinburgh-Aberdeen rail line, a key passenger and freight route providing approximately 70 train services per day. To protect this valuable link and maintain service for current and future customers, phased refurbishment works were required to strengthen the structure, prevent rust and improve its appearance. This project ensures a 125-year structural life span, with no further treatment works required for 25 years.